TALLAHASSEE, Fla. (AP) — A.J. Dillon is among the top running backs in the country and has been the driving force in Boston College’s success this season. The only thing that has slowed down the sophomore has been an injured ankle. Dillon, a 240-pound sophomore, has run for 936 yards and eight touchdowns in just eight games. He missed two games in October due to the ankle injury but averages 5.3 yards per carry. Florida State couldn’t stop Dillon in 2017. 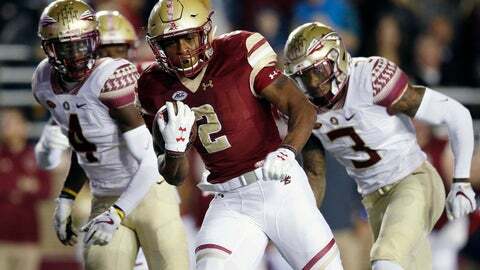 As a freshman, Dillon ran for 149 yards and a touchdown in BC’s 35-3 rout of the Seminoles. Now Florida State (4-6, 2-5 Atlantic Coast Conference) must minimize the damage that Dillon inflicts if they hope to defeat No. 22 BC (7-3, 4-2) and keep the Seminoles’ bowl hopes alive. Dillon is ranked 25th in the FBS in rushing yards despite missing two games. And he is ninth in rushing yards per game (117.0). BC coach Steve Addazio said that Dillon practiced more this week than usual. Dillon often rests his ankle in practices early in the week but was a full participant on Wednesday, Addazio said. Since returning from injury, in which BC lost at NC State and defeated Louisville, Dillon ran for 149 yards in the win over Miami on Oct. 26 and 96 yards in a victory over Virginia Tech. He re-injured the ankle in the fourth quarter of Saturday’s loss to Clemson after rushing for just 39 yards on 16 carries. Dillon will be quite a handful for the Seminoles. Florida State has allowed 122, 177 and 365 rushing yards in consecutive losses to Clemson, NC State and Notre Dame. Taggart said for Florida State it’s a “want to” stop Dillon. BC quarterback Anthony Brown suffered an abdominal injury when he was tackled by Clemson defensive lineman Christian Wilkins in Saturday’s game. Brown had initially been considered day-to-day but has practiced for the Eagles leading up to the matchup with the Seminoles. Deondre Francois will be Florida State’s starting quarterback “unless something dramatic happens,” Taggart said. Francois completed 23 of 47 passes for 216 yards and an interception in the 42-13 loss at Notre Dame on Saturday. Francois has played well at times this season, throwing for 300 or more yards in wins over Samford, Northern Illinois and Wake Forest. But he completed just 47.2 percent of his passes against Clemson and 48.9 percent of his passes at Notre Dame. Florida State started a ninth different offensive line combination in 10 games this season, which is the most of any Power 5 team. Landon Dickerson, considered the team’s top lineman, has played in just two games this year due to an ankle injury and Taggart said there is no timetable for him to return to practice. Guard Cole Minshew (neck stinger) could miss his second straight game. Redshirt freshman Brady Scott had started six straight games before the coaches opted not to play him at Notre Dame. It’s not clear if Scott will play vs. BC.